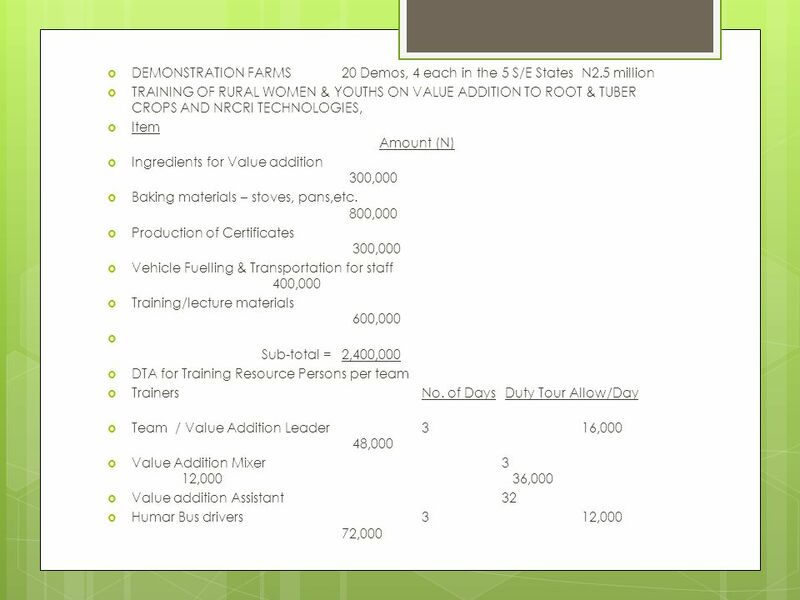 NATIONAL ROOT CROPS RESEARCH INSTITUTE, UMUDIKE 2012 Report. 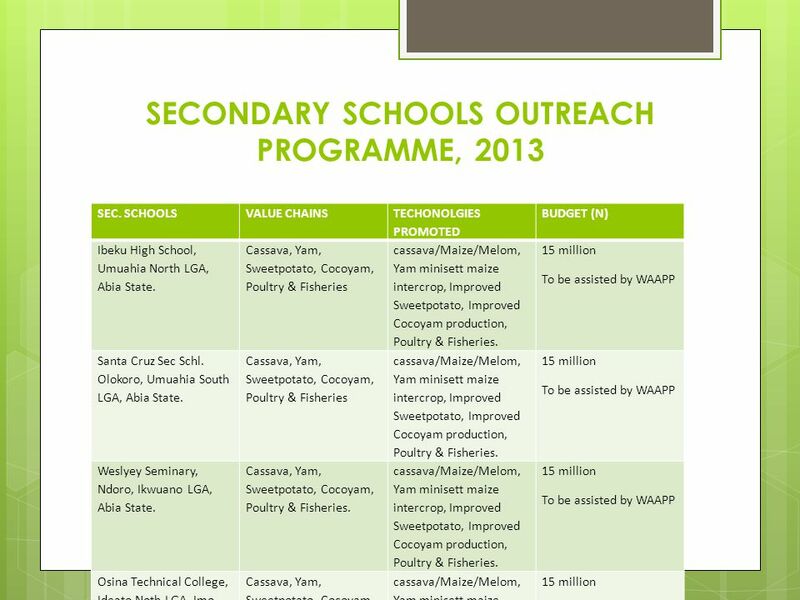 1 NATIONAL ROOT CROPS RESEARCH INSTITUTE, UMUDIKE 2012 Report. 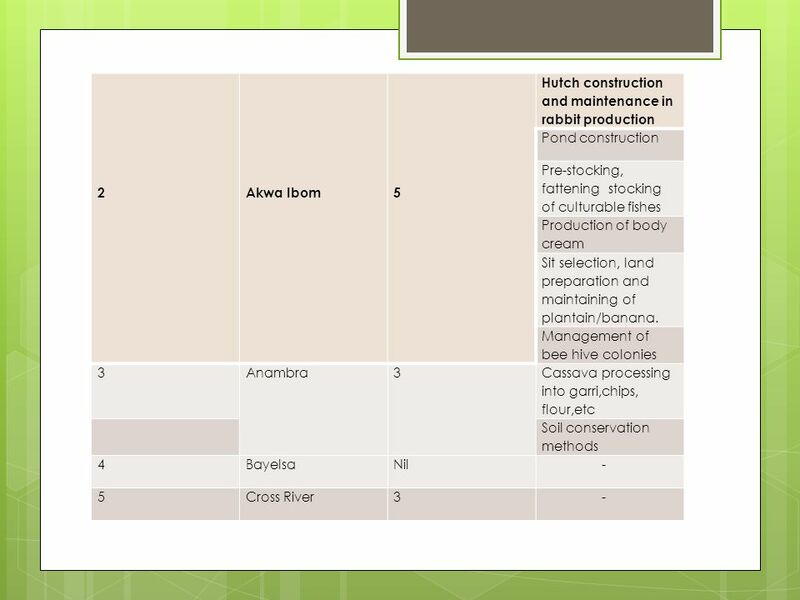 QUARTER NO. 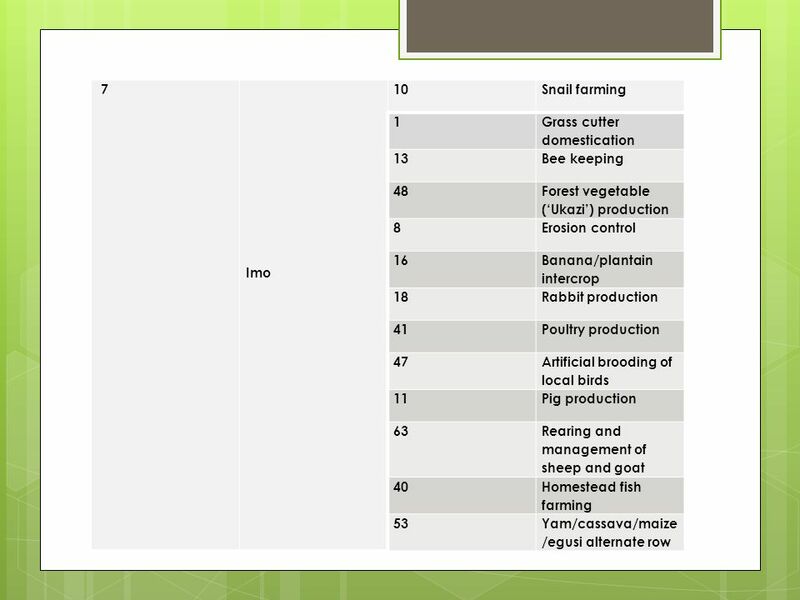 PARTICIPATING STATE NO. 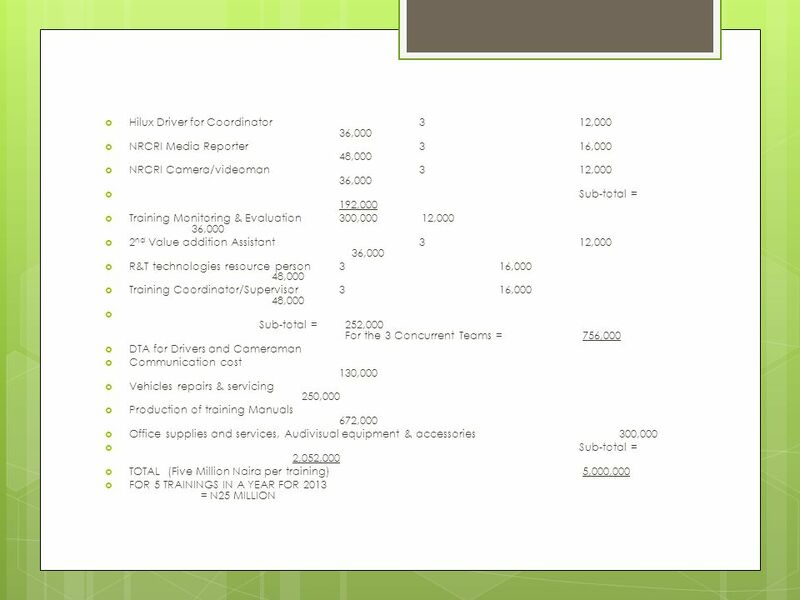 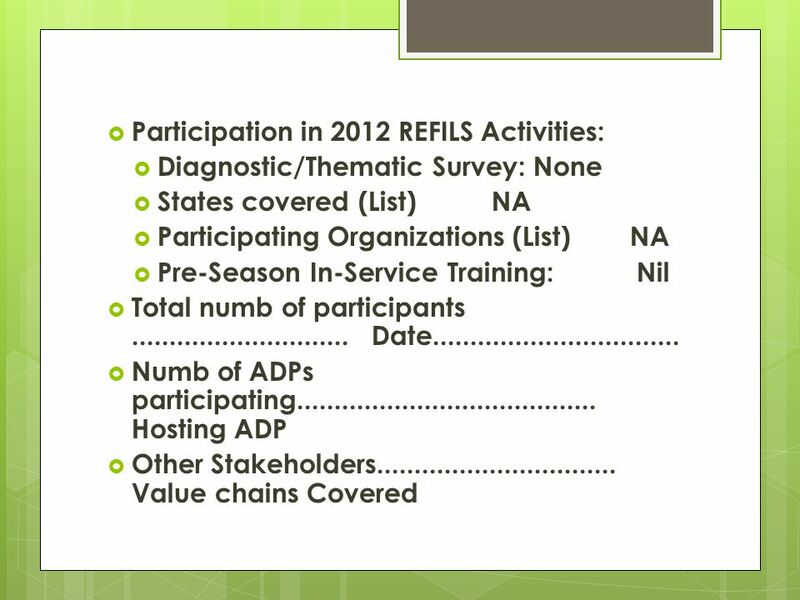 PARTICIPATING NARIS OTHER ORGANIZATIONS FIRST QTR 6 2 Nil SECOND QTR - THIRD QTR FOUND QTR. 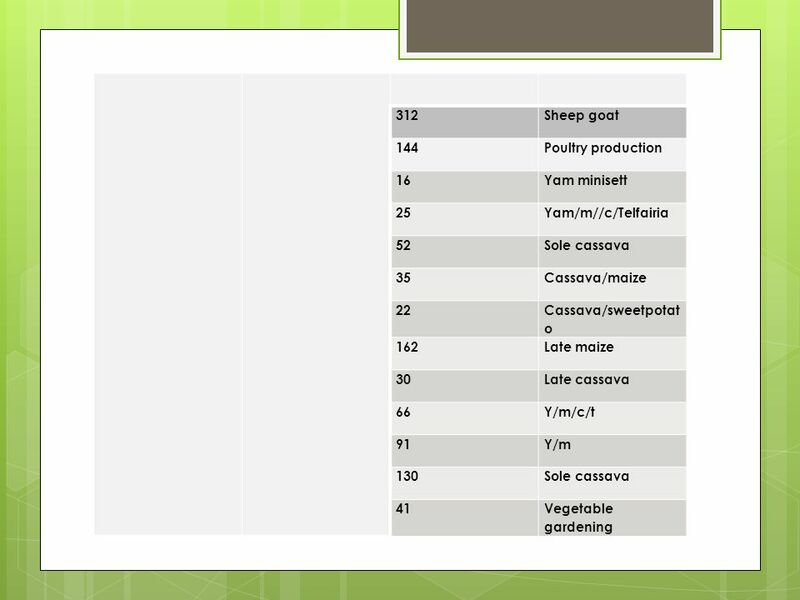 17 6. 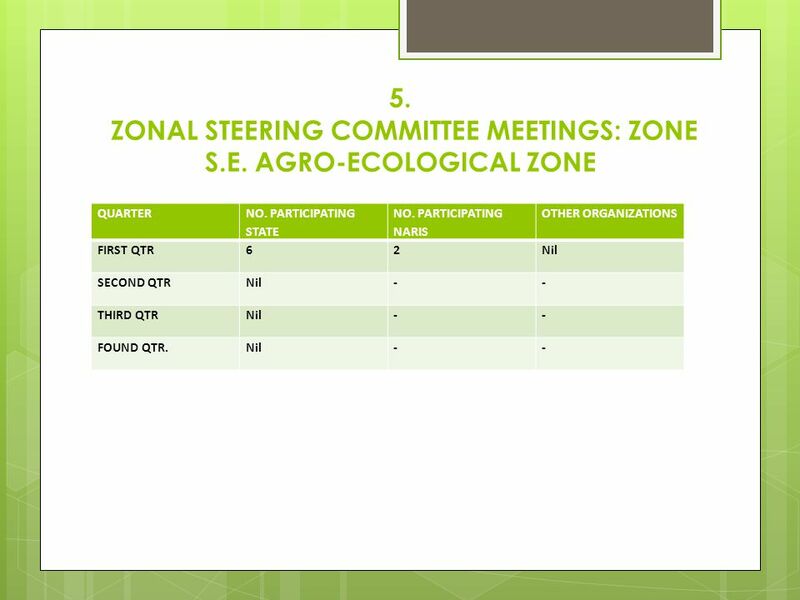 ZONAL TECHNICAL COMMITTEE MEETINGS: ZONE. 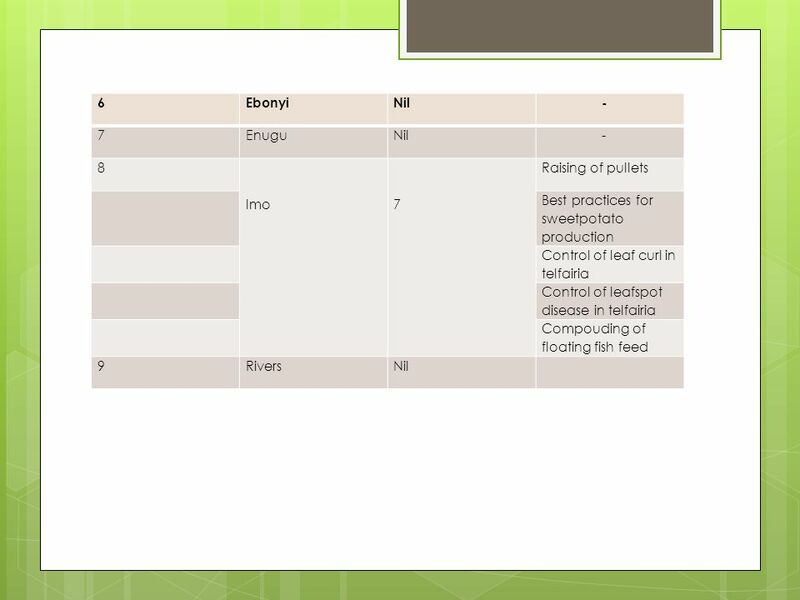 TYPEOF EXT PUBS. 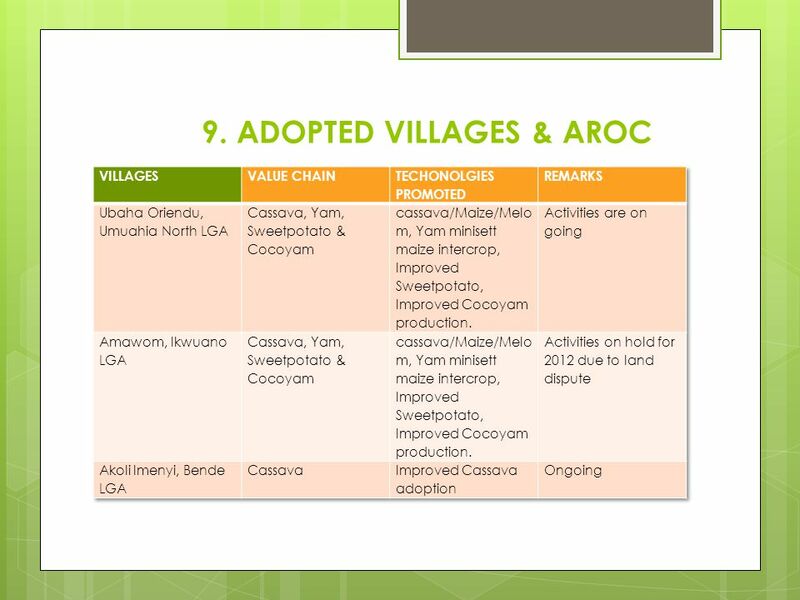 NO VALUE CHAINS COVERED REMARKS. 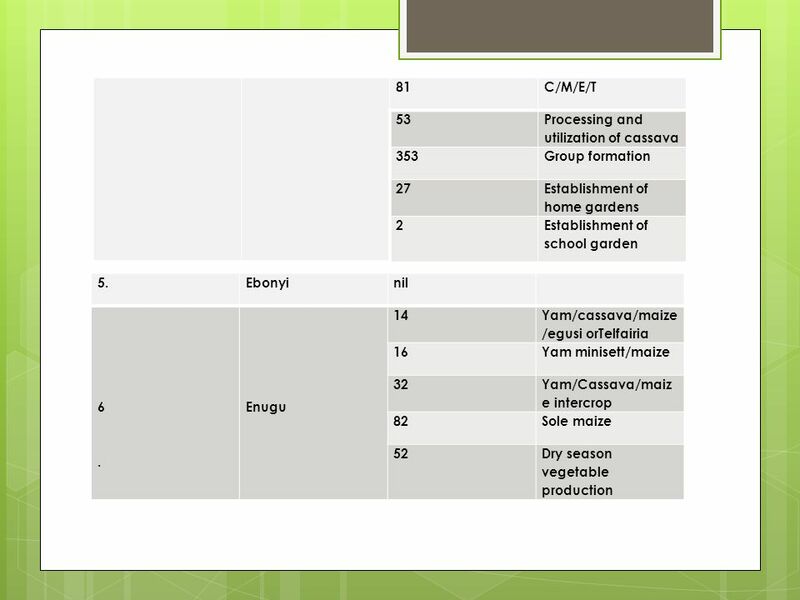 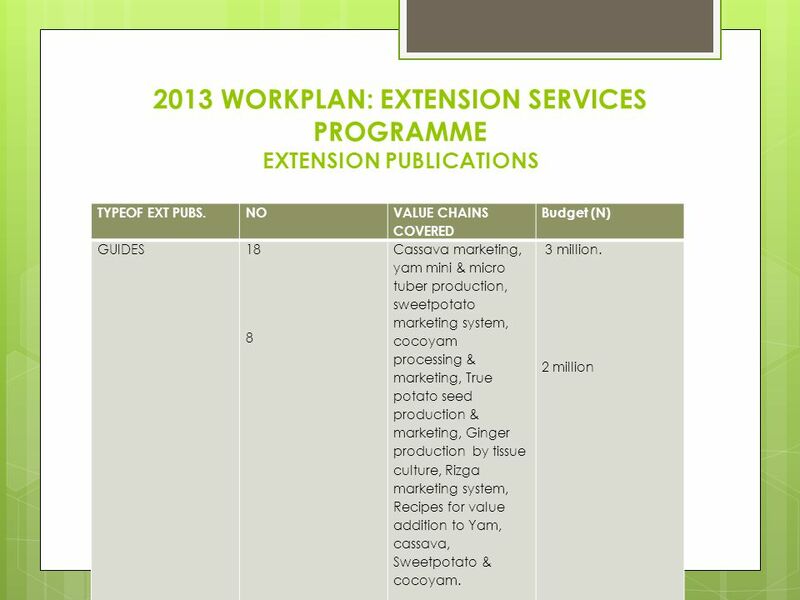 GUIDES 20 Cassava production & processing, yam production, sweetpotato production & marketing, cocoyam production, potato production, Ginger production & marketing, Rizga production, Improved Bee Keeping. 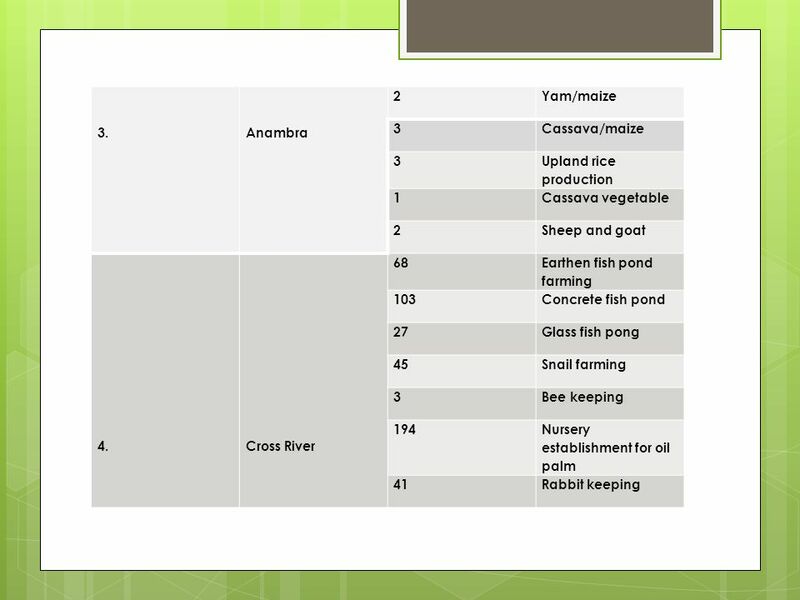 Recipes for Yam, cassava, Sweetpotato & cocoyam In circulation & being distributed. 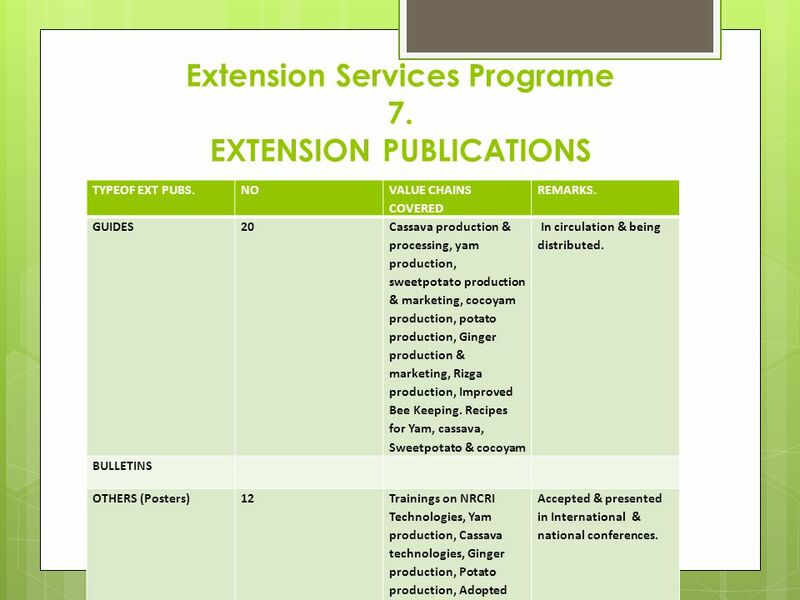 BULLETINS OTHERS (Posters) 12 Trainings on NRCRI Technologies, Yam production, Cassava technologies, Ginger production, Potato production, Adopted Village & School Outreach programme. 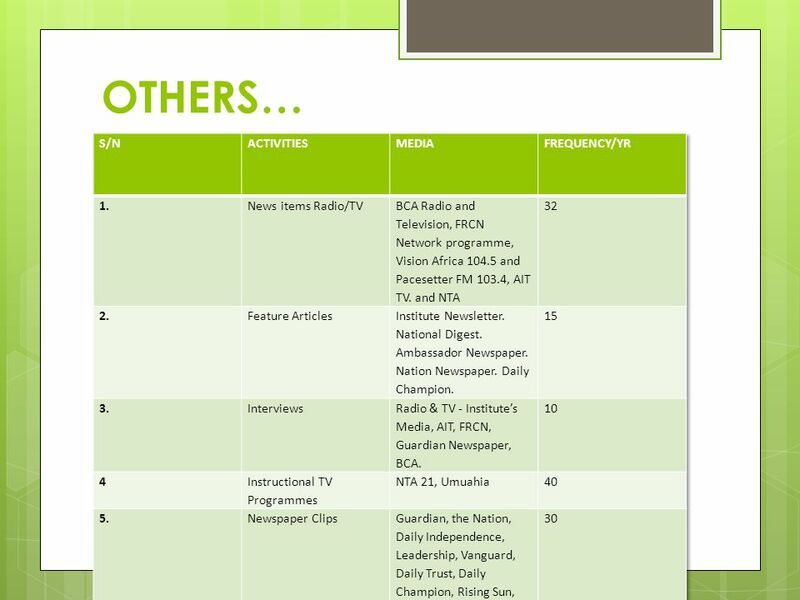 Accepted & presented in International & national conferences. 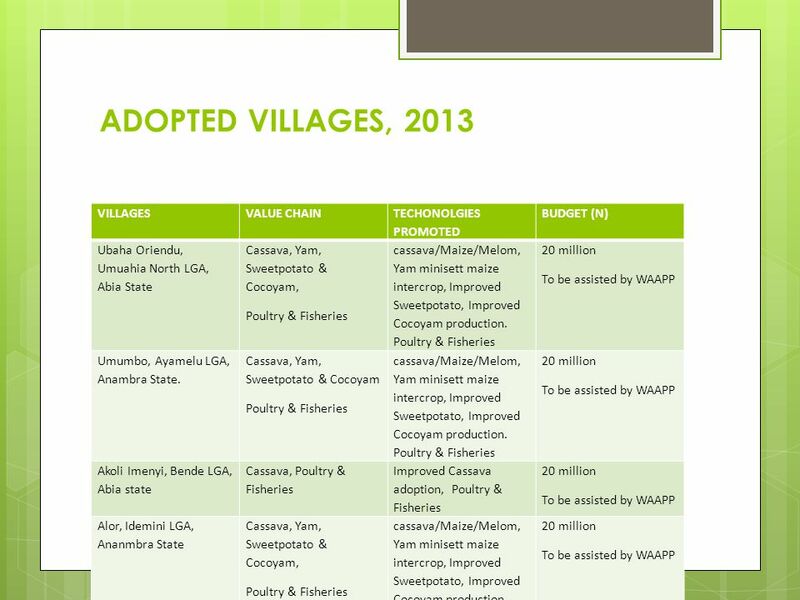 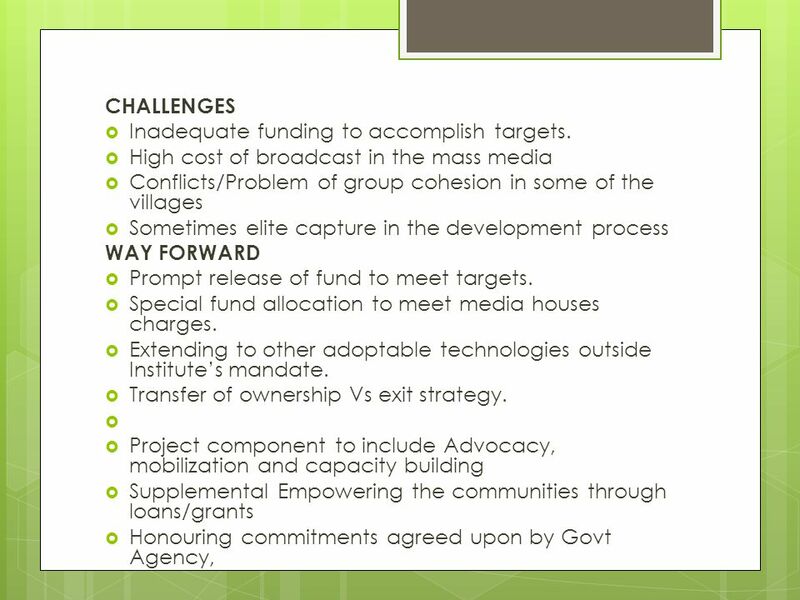 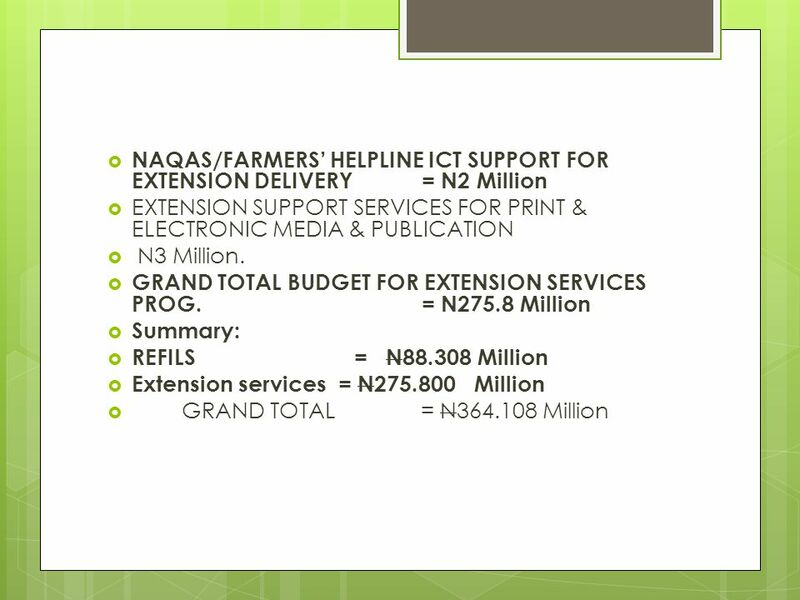 To be held in the 6 Sub-Stations each N1 million	= N6 million ADOPTION & IMPACT ASSESSMENT: Five different adoption studies to be held in 3013:	= N2.5 million. Evaluation of extent of adoption of whitefly resistant sweet potato varieties disseminated and spread in the DFID whitefly sweet potato pilot states. Evaluation of Youths and Farmers Participation In Demonstration of Technologies across Locations In South Eastern Nigeria. 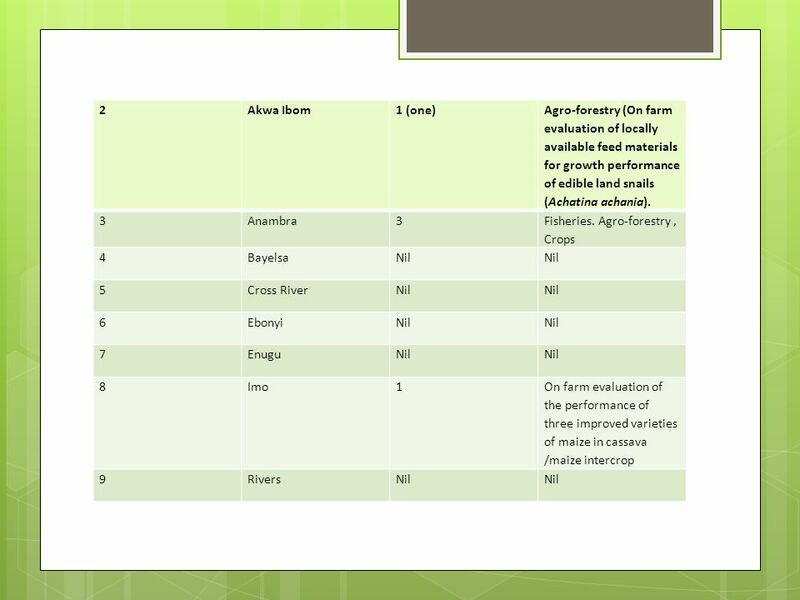 Assessment Of The Constraints Militating Against Effective Transfer And Adoption Of Root And Tuber Crops Technologies In South Eastern Nigeria. 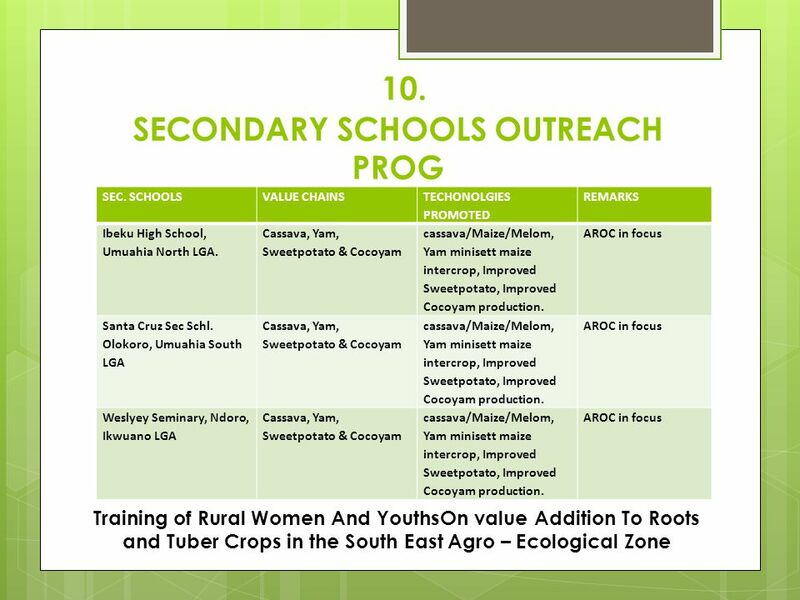 Impact of the training on value addition to root/tuber crops conducted by NRCRI from in the Communities trained. 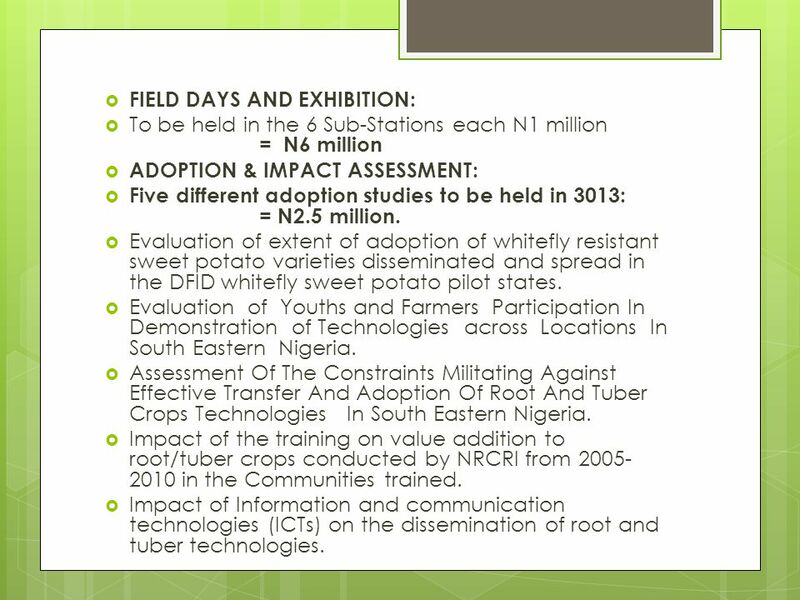 Impact of Information and communication technologies (ICTs) on the dissemination of root and tuber technologies. 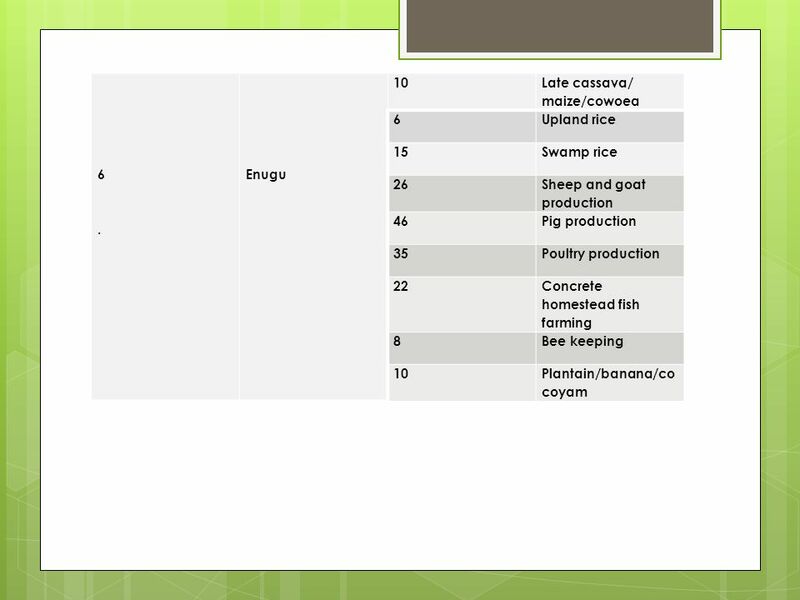 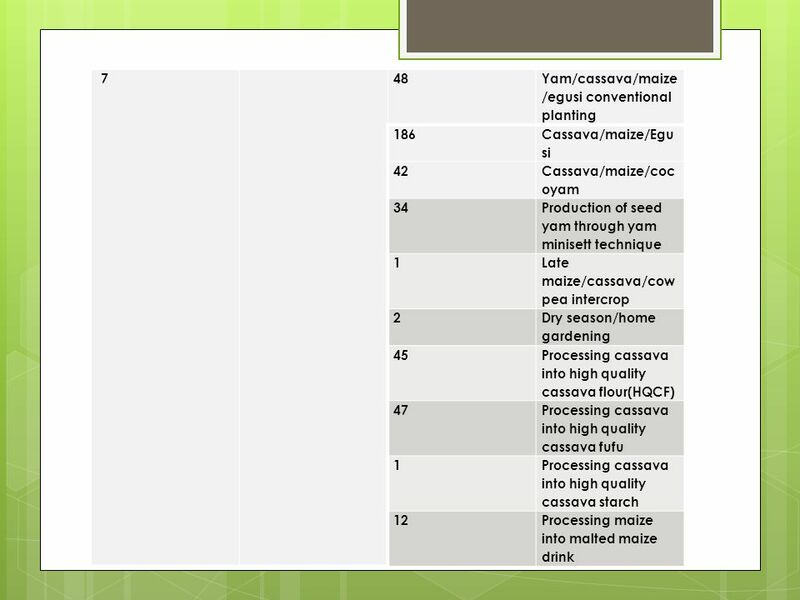 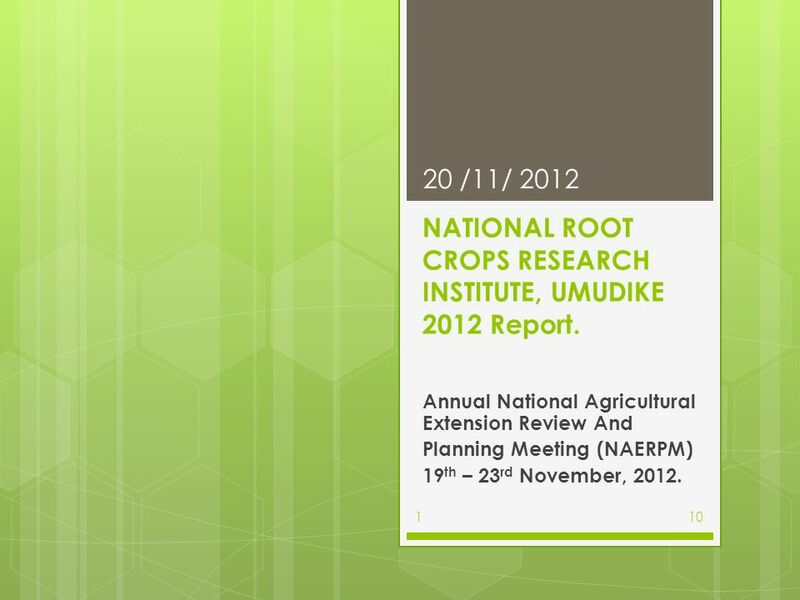 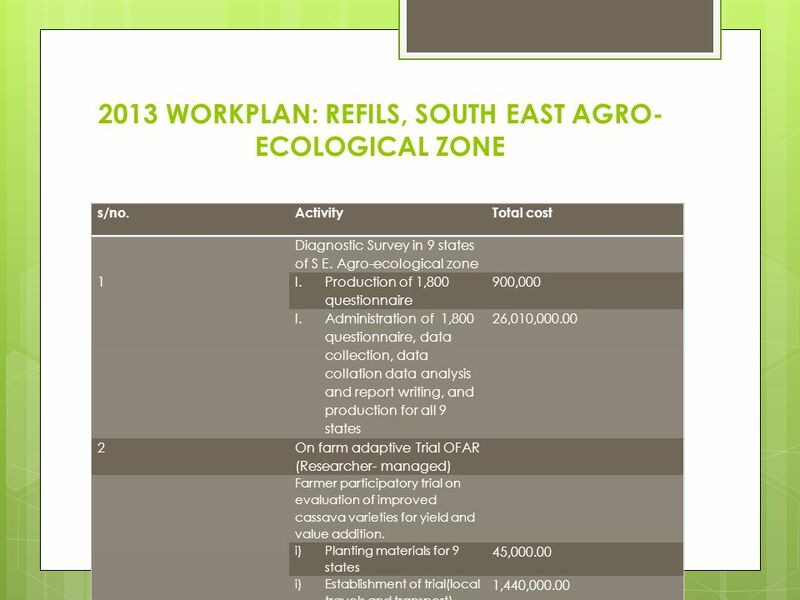 Download ppt "NATIONAL ROOT CROPS RESEARCH INSTITUTE, UMUDIKE 2012 Report." 1 Measuring Progress: Monitoring and Evaluation in WRIA 8 WRIA 8 Salmon Recovery Council November 19, 2009 Scott Stolnack WRIA 8 Technical Coordinator.